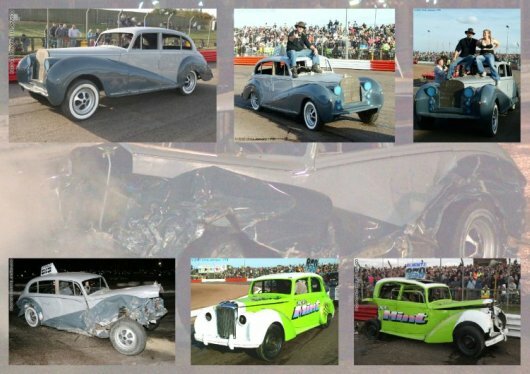 The Dutchman Pieter Leistra bangers an exclusive 1949 James Youngh Bentley to heaven at the Essex Arena in UK 2007. The jury mentioned it the crash of the day and the crazy Dutchman got a trophy for it. Simon Rolph, the driver of the car which was hit hard on the back was not harmed and angry at all. He even gave the crazy Dutchman a compliment and said: Nice work, bloke. The bangered Bentley of 1949 was a design of James Youngh. Only five were made of this model. One of the five left is in a Bentley museum and is insured for 1.300.000 Euros. Now an other one of the remaining cars was smashed in a demolition derby at the Essex arena in 2007. Also the car which was serious hit on the back by Pieter Leistras Bentley was a nice Alvis TA 21 Graylady of the late 40s or 50s, driven by Simon Rolph. Below you will find some movies before, during and after the banger crash. Even today many British classics come to their end in this demolition derbys in UK. Many Jaguars, Daimlers, Rolls Royces, Benleys etc. have find their final rest. Also classic British hearses and ambulances are popular because of their massive weight. After I found out about the bagered 1949 James Youngh Bentley. I searched on the Internet for other UK classics which were bangered away. In this paragraph you will find what I found. It might not make the real classic enthusiats happy. These exclusive cars have been bangered to wrecks.